Research Note: No Marriage found in GRO Index for Catherine Pask and James Young. [S533] Image of the 1861 Census for Stamford, Lincolnshire: RG9 Piece 2312 Folio 98 Page 18 from Archive CD Books. [S571] Image of the 1841 Census for Stamford, Lincolnshire: HO107 Piece 625 Book 6 Folio 9 from Archive CD Books. [S534] Image of the 1871 Census for Stamford, Lincolnshire: RG10 Piece 3308 Folio 75 Page 23. Indexed incorrectly under the name of RASK. [S535] Transcript of the 1881 Census for Stamford, Lincolnshire: RG11 Piece 3192 Folio 23 Page 6. [S4] GRO Indexes to Deaths. "1883/Q1 YOUNG, Joseph Stamford 7a 205 aged 69." [S4999] Website UK Government Probate Search Service: YOUNG Joseph. 13 February 1883. The Will of Joseph Young late of Stamford in the County of Lincoln Shoemaker who died 5 January 1883 at Stamford was proved at the Principal Registry by Edward Pask of Stamford Shoemaker the sole Executor. Personal Estate £104 3s 6d. [S536] Image of the 1891 Census for Stamford, Lincolnshire: RG12 Piece 2552 Folio 115 Page 8. [S537] Image of the 1901 Census for Stamford, Lincolnshire: RG13 Piece 3020 Folio 13 Page 18. [S5551] Image of the 1911 Census : RG14PN19420 RG78PN1159 RD411 SD1 ED8 SN174. [S3] GRO Indexes to Marriages. "1889/Q1 YOUNG, Edward = BOOR, Sarah Ann Stamford 7a 387." [S2] GRO Indexes to Births. "GRO Online Index: 1853/Q2 PASK, Edward --- Stamford 7a 265." [S5508] Website FindmyPast: Lincolnshire Parish Registers 1538-1911: Baptisms All Saints' Church Stamford 6 June 1855 Edward son of Catherine Pask. [S538] Image of the 1861 Census for Stamford, Lincolnshire: RG9 Piece 2313 Folio 9 Page 12 from Archive CD Books. [S1661] Image of the 1851 for Londonthorpe, Lincolnshire: HO107 Piece 2094 Folio 111 Page 3. Enumerated under the name of GREGORY. [S4111] Website Barrall Marriage Index (http://www.barrallmarriageindex.co.uk/1801.html: ). [S6] Teresa & Stuart Pask's Guesses, Theories and Speculations: Based on the fact that his wife was a servant living with her children. [S572] Transcript of the 1871 Census for Stamford, Lincolnshire: RG10 Piece 3308 Folio 86 Page 16 from Ancestry.co.uk - 1871 England Census (http://www.ancestry.co.uk) Image not currently available. [S573] Transcript of the 1881 Census for Stamford, Lincolnshire: RG11 Piece 3192 Folio 49 Page 17. [S6] Teresa & Stuart Pask's Guesses, Theories and Speculations: Based on 1871 Census. [S3] GRO Indexes to Marriages. "1875/Q3 PASH, Elizabeth Stamford 7a 541." [S808] Image of the 1891 Census for Stamford, Lincolnshire: RG12 Piece 2553 Folio 7 Page 9. [S809] Image of the 1901 Census for Stamford, Lincolnshire: RG13 Piece 3020 Folio 39 Page 6. Indexed incorrectly under the name of PASH. [S539] Image of the 1861 Census for Stamford, Lincolnshire: RG9 Piece 2312 Folio 80 Page 13 from Archive CD Books. [S5546] Image of the 1861 Census : LINRG09 Piece 2312 Folio 80 Page 13. [S3] GRO Indexes to Marriages. "1858/Q1 PASK, Lambert = DEAN, Sarah Stamford 7a 337." [S4] GRO Indexes to Deaths. "1870/Q1 PASK, Lambert Stamford 7a 204 age 61." [S387] Website Family History Online (http://www.familyhistoryonline.net: ) National Burial Index (Lincolnshire FHS): Lambert PASK 17 Mar 1870 Aged 61 Stamford All Saints. [S4] GRO Indexes to Deaths. "1872/Q1 PASK, Sarah Stamford 7a 197 age 68." [S776] Image of the 1871 Census for Union Workhouse St Martin, Stamford, Lincolnshire: RG10 Piece 3309 Folio 79 Page 6. [S387] Website Family History Online (http://www.familyhistoryonline.net: ) National Burial Index (Lincolnshire FHS): Sarah PASK 1 Feb 1872 68 Stamford All Saints. Research Note: Searched for the family in 1901 Census but not found. [S2] GRO Indexes to Births. "1865/Q2 PASK, Arthur Lambert Stamford 7a 290." [S540] Image of the 1891 Census for Nottingham, Nottinghamshire: RG12 Piece 2694 Folio 71 Page 29. [S547] Image of the 1881 Census for Nottingham, Nottinghamshire: RG11 Piece 3358 Folio 10 Page 14. [S807] E-mail from Charlene Herbert to Stuart & Teresa Pask dated 16 November 2004. [S3] GRO Indexes to Marriages. "1887/Q1 PASK, Arthur Lambert Nottingham 7b 399." [S2] GRO Indexes to Births. "1891/Q3 PASK, Arthur Lambert Nottingham 7b 331." [S807] E-mail from Charlene Herbert to Stuart & Teresa Pask dated 19 November 2004: "Sarah kept the name Markham because she didn't like the name Pask!" [S4972] E-mail from Graham Ramsdale to Stuart & Teresa Pask dated 12 November 2014. [S2] GRO Indexes to Births. "1887/Q3 PASK, Beatrice Alma Nottingham 7b 244." [S807] E-mail from Charlene Herbert to Stuart & Teresa Pask dated 15 November 2004. [S3] GRO Indexes to Marriages. "1919/Q4 HERBERT, John T. MARKHAM Llanelly 11a 2876." [S3] GRO Indexes to Marriages. "1919/Q4 MARKHAM, Beatrice A. HERBERT Llanelly 11a 2876." [S2] GRO Indexes to Births. "1888/Q4 PASK, Edward George Nottingham 7b 307." [S541] Image of the 1871 Census for Marylebone, London: RG10 Piece 170 Folio 19 Page 32. Indexed incorrectly under the name of TRICE. [S542] E-mail from Colleen Willis to Stuart & Teresa Pask dated 16 September 2004. 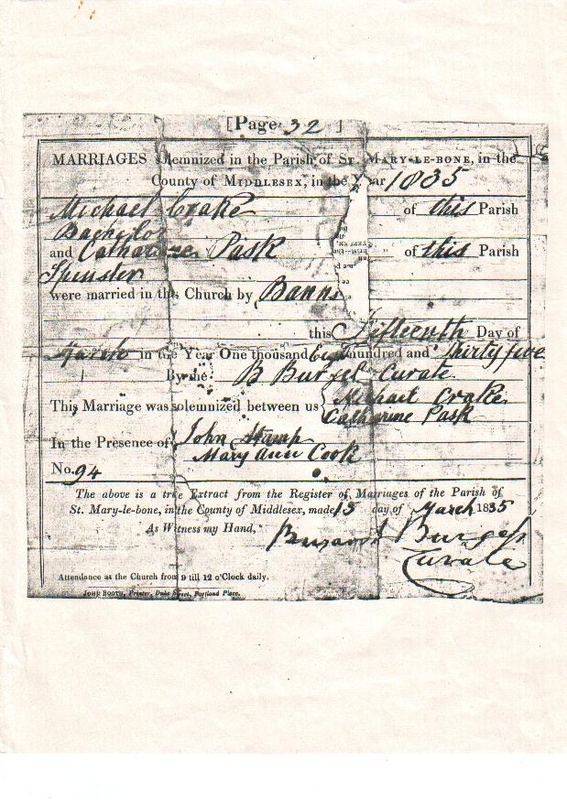 [S543] Copy of the marriage certificate of Michael Crake and Catharine Pask, 15 March 1835. Kindly provided by Colleen Willis. [S416] Website Ancestry Civil Registration - Deaths: 1852/Q2 CRAKE Michael, Marylebone 1a 285. [S542] E-mail from Colleen Willis to Stuart & Teresa Pask dated 5 September 2004. [S542] E-mail from Colleen Willis to Stuart & Teresa Pask dated 28 September 2004. [S27] Website National Burial Index (NBI) @ FindMyPast (www.findmypast.co.uk: ) 12 Mar 1836 Edward PASK 65 Northamptonshire Barnack, St John the Baptist. [S2956] E-mail from Kirstie Moore to Stuart & Teresa Pask Pallot's Marriage Index for England: 1780 - 1837: Edward Pask & Sarah Newborn 1796 Westminster, Middlesex. [S27] Website National Burial Index (NBI) @ FindMyPast (www.findmypast.co.uk: ) 1 Aug 1842 Sarah PASK 70 Northamptonshire Barnack, St John the Baptist. [S4] GRO Indexes to Deaths. "1842/Q3 PASK, Sarah Stamford 14 358." [S544] Image of the 1901 Census for Stamford, Lincolnshire: RG13 Piece 3019 Folio 19 Page 29. [S2259] Website Rootsweb Mailing List - Lincolnshire: http://archiver.rootsweb.com/th/read/ENG-LINCSGEN/2005-05/… Stamford Workhouse, submitted by Ann Cole. [S575] Image of the 1861 Census for Stamford, Lincolnshire: RG9 Piece 2311 Folio 94 Page 17 from Archive CD Books. [S773] Image of the 1871 Census for All Saints, Stamford, Lincolnshire: RG10 Piece 3309 Folio 112 Page 33. [S546] Transcript of the 1881 Census for Stamford, Lincolnshire: RG11 Piece 3191 Folio 20 Page 33. Indexed incorrectly under the name of PARK. [S545] Image of the 1891 Census for Stamford, Lincolnshire: RG12 Piece 2552 Folio 15 Page 23. Indexed incorrectly under the name of PARK. [S548] Image of the 1891 Census for Newark, Nottinghamshire: RG12 Piece 2714 Folio 79 Page 18. Indexed incorrectly under the name of PARK. [S2] GRO Indexes to Births. "1865/Q2 PASK, Ann Lincoln 7a 450." [S5508] Website FindmyPast: Lincolnshire Parish Registers 1538-1911: Baptism: Navenby June 11 1865 Ann dau of Samuel & Mary Pask of Navenby, a Labourer. [S549] Image of the 1891 Census for Newark, Nottinghamshire: RG12 Piece 2714 Folio 80 Page 19. Indexed incorrectly under the name of PARK. [S417] Website Ancestry Civil Registration - Marriages: "1897/Q3 SHAW, Annie Newark 7b 755 = George SOUTHERN." [S555] Image of the 1861 Census for Navenby, Lincolnshire: RG9 Piece 2354 Folio 16 Page 26. [S3] GRO Indexes to Marriages. "1875/Q1 PASK, Mary Ann Newark 7b 512." [S3] GRO Indexes to Marriages. "1878/Q1 PASK, Susannah = COBB, Mark Newark 7b 439." [S562] E-mail from John Gunson to Stuart & Teresa Pask dated 20 September 2004. [S580] Copy of the marriage certificate of Mark Cobb and Susannah Pask, 16 February 1878. Kindly provided by John Gunson.